MasterChef Junior on Fox, reviewed. 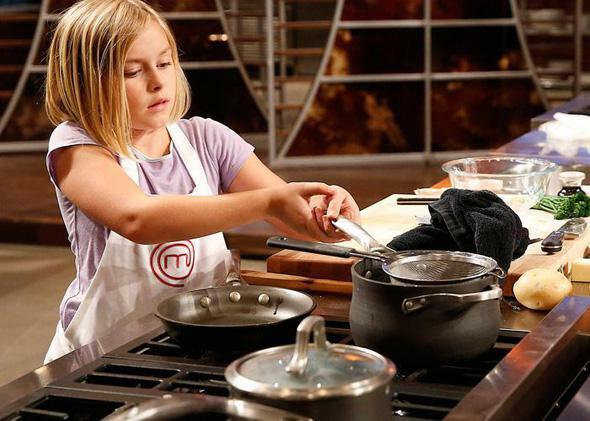 Why MasterChef Junior is the best competition show on TV. MasterChef Junior features a gentler Gordon Ramsay. The best competition show on television stars 11-year-olds. But as soon as I started watching Fox’s MasterChef Junior, which airs on Friday nights and features prodigy cooks ages 8 to 13, my reservations evaporated. Like the Scripps National Spelling Bee, MasterChef Junior is a celebration of talent, precocity, merit, obsession, and, above all, losing. Watching, you may wish you could sear a fillet as well as these kids—probably, you cannot—but you will wish even more that you could once again be strong and brave and 11, when losing hurt so bad—but only for about 11 seconds. 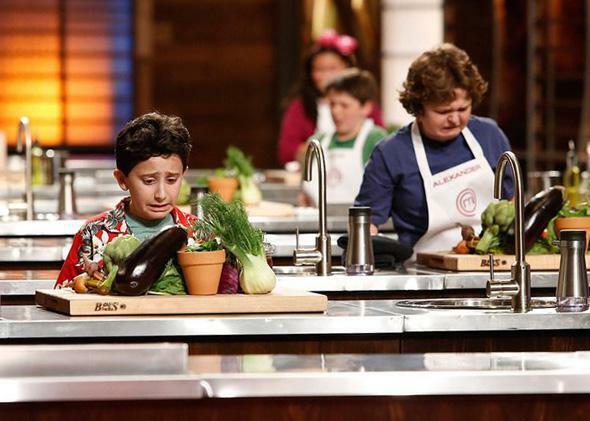 Sure, there are tears on MasterChef Junior, but so what? Kids cry all the time with or without the famously fierce Gordon Ramsay’s help. What MasterChef Junior reveals is that it’s adults who are fragile. Like all engaging reality TV stars, the junior chefs are unburdened by self-consciousness, but because they are preteens, this is age-appropriate and not a manifestation of narcissistic personality disorder. They have endearing personalities without all the triangulation and effort that goes into being a “personality.” Jack is a 10-year-old from the Rockaways, an old man stuck in a little boy’s body, with a kind, conciliatory spirit, a tendency to collapse on the floor with relief, a collection of Hawaiian shirts, and an old-school New Yawk accent. Sarah, blond and 9, is scared of nothing but clowns. Troy hides a bossy streak and preternatural skills under SoCal bangs and intonations: “Is it going to be duck, chicken, or horse?” he asks the camera. “You never know, man.” With just two episodes left, the heavy favorite to win the title and $100,000 is also the oldest contestant, 13-year-old Alexander, who seems like he was born in the wrong time: He was meant to be not a kid playing Xbox but a quiet, serious, scholarly master of haute cuisine. The junior home cooks discover what is in their Mystery Box. The mini-chefs face adult-sized challenges—offal, beef Wellington—but the show’s great strength is that it does not treat them quite like adults. Ramsay, who is clearly comfortable with kids, has dialed back the screaming. He is serious and occasionally stern, but fundamentally kind. He doesn’t yell, and he doesn’t condescend. When Sofia falls wildly behind, he rolls up his sleeves and teaches her how to cream butter. When another contestant’s soufflé fails to rise, he gives her concrete advice—“Fill the mold half-full and it will cook twice as fast”—and tells her to go easy on herself. He lets a little girl pour botched and runny whipped cream all over his head. When Sarah tells him to be careful with a pan, he says, “You’re telling me to be careful?” and then thinks better of it, teaching her how to flip her sauté in exchange for her concern. When something tastes bad, he says it simply, without berating: “This is like biting into a mouthful of salt. What a shame.” He seems like a great teacher: a secret softie, fair and demanding, who expects the best. And MasterChef Junior does believe that the one of these kids is the best. In a roomful of children who are all demonstrably special, one is still going to be deemed the most special, and so each week the kids are culled, sometimes for doing nothing wrong but having a partner who oversalted the beef. The contestants don’t always take it well, but they take it so much better than just about every grown-up I’ve ever seen getting eliminated from a reality show. They lose, they tear up, they wipe off their tears and then say how much fun they had, and how great they feel to have gone this far. For grown-ups, a competition show is a referendum on their life’s work or dreams. But the kids on MasterChef get to go back to full lives—school, family, hobbies, friends, and yes, cooking—having gotten to spend time in a place as cool as the MasterChef test kitchen, their life’s work still ahead of them. Losing is part of growing up, part of soccer and footraces, hide-and-seek and board games, part of having siblings and teachers and parents. Losing, as much as we can help it, is not a part of being an adult. These kids still know, better than most adults, that the fun part is playing the game.